Guwahati, Aug 13 : Thuingaleng Muivah, general secretary of the National Socialist Council of Nagaland-Isak Muivah (NSCN-IM), has asked the Nagas to “understand the problems of India” and respect the “rights of neighbouring states” while awaiting details of the Naga peace accord. His appeal came during a 40-minute reception – subdued by Nagaland standards – outside the airport in Dimapur, the state’s commercial hub, on Wednesday afternoon. This was his first visit to Nagaland after the signing of the framework agreement earlier this month. “What we signed was a framework agreement that paves the way for the final accord. 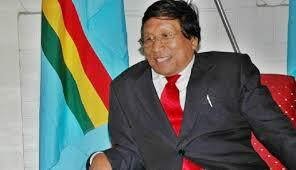 All Naga groups and stakeholders would be consulted before the final deal is done,” Muivah said. He insisted solutions to the six-decade-old Naga political crisis would be based on shared sovereignty, but indicated the NSCN-IM was keen on avoiding confrontation with Nagaland’s neighbours without naming Arunachal Pradesh, Assam and Manipur. “Nagas will have their rights, but we should also respect the rights of the neighbouring states,” Muivah said, adding the Nagas should also understand New Delhi’s compulsions in arriving at a solution acceptable to all. The governments of Arunachal Pradesh, Assam and Manipur had welcomed the announcement of the framework agreement with the NSCN-IM. But they are wary of the contents in view of the NSCN-IM agenda of integration of Naga-inhabited areas under one administrative unit. These areas of Greater Nagalim (Nagaland), as the outfit envisages, include four hill districts of Manipur, three of Arunachal Pradesh and large swathes of Assam bordering Manipur.